Whether it's your first time roasting a turkey, or you're a seasoned pro, you can ensure flavorful results with this tried-and-true recipe. It's so simple to make this classic, you'll find it's your anytime turkey recipe...no need to wait for Thanksgiving. 1) Remove the package of the giblets and neck from the turkey cavity. Rinse the turkey with cold water and pat dry with a paper towel. Tie the ends of the drumsticks together. 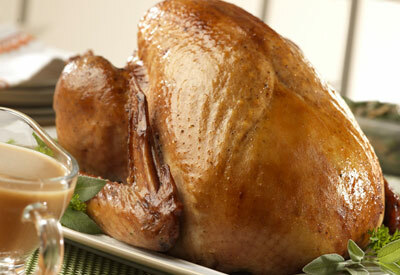 2) Place the turkey, breast side-up, on a rack in a shallow roasting pan. Brush the turkey with the stock. Insert a meat thermometer into the thickest part of the meat, making sure the thermometer is not touching the bone. 3) Roast at 325 degrees F for 3 to 3 1/2 hours or until the thermometer reads 180 degrees F and the drumstick moves easily, basting occasionally with the stock. Begin checking for doneness after 2 1/2 hours of cooking time. Let stand for 10 minutes. 4) Remove the turkey from the roasting pan. Pour off any fat. Stir the stock and flour in a small bowl until the mixture is smooth. Stir the stock mixture in the pan. Cook and stir over medium heat until the mixture boils and thickens. Season to taste. Serve the gravy with the turkey. Void if altered, copied, sold, purchased, transferred, exchanged or where prohibited or restricted by law. One coupon per purchase of specified product(s). Good only in USA, APOs FPOs. CONSUMER: No other coupon may be used with this coupon. Consumer pays any sales tax. RETAILER: Small Planet Foods will reimburse you the face value of this coupon plus handling if submitted in compliance with our redemption policy. Copy available upon request. Cash value 1/100�. Small Planet Foods 8, NCH Marketing Services, P.O. Box 880001, El Paso TX 88588-0001 or an authorized clearinghouse.